Learning new crafty skills, is a good, albeit dangerous thing. Today at Brown Owls I learnt some embroidery basics. I felt completely lost when I first sat down with my tea towel, embroidery floss, needle and pattern, but with lots of help from lots of lovely Brown Owl ladies (sorry if I forgot anyone who gave me words of wisdom! ), I was happily on my way. I think I’m starting to get the hang of it now – it certainly feels like I’m getting through sections a bit quicker, and I think the stitches are looking a bit neater and more even! 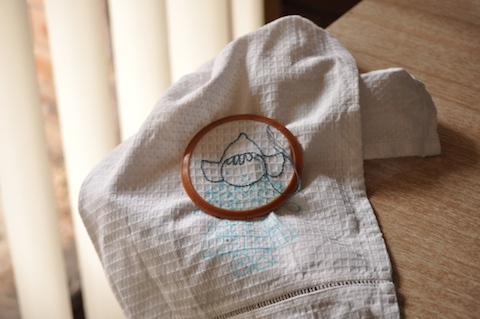 The only danger associated with embroidery, besides the inevitable needle-in-finger attacks, is that it will be competing with knitting (and occasionally sewing) for my attention. I feel so unproductive already without another crafty hobby! It really is about time someone came up with a 30 hour day. You rock! Did you know that in stitchery terms, what you are doing (all in one colour) is called “bluework”? Then there’s redwork, and greenwork, and dammit there should be an orangework too… blackwork, though, is something different again!